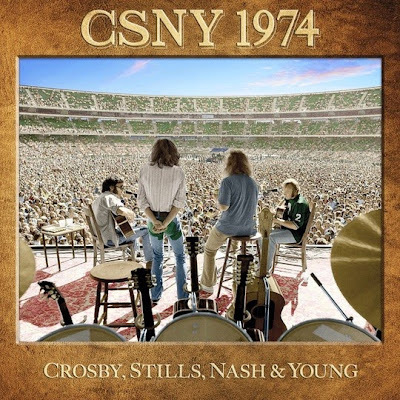 Here's a preview review of upcoming box set by Crosby, Stills, Nash & Young - CSNY 1974 set for release next week. Now #10 #7 on Amazon Top 100 in Music Best Sellers Rank. There’s rarities from Young as well, but they’re more from the crowd-pleasing end of his spectrum. ‘Traces’ is a pleasant country-rocker, ‘Love/Art Blues’ could be a sober take from Tonight’s The Night, while 'Hawaiian Sunrise’ is a fine showcase for the harmonies all four could bring to the table. Well known to Young aficionados, they’re excellent at painting a picture of where the Canadian was at this moment in time, caught between the dark thoughts of On The Beach and Tonight’s The Night, and the lighter shades later revealed on Long May You Runand Comes A Time. Indeed, the finest thing that CSNY 1974 does is serve as a clear snapshot of this band at this extraordinary moment in their lives. It captures the musical excess of the era perfectly (at one point Crosby exclaims ‘don’t worry, we’ve got a couple of hours to go yet!’ and is greeted with wild cheers), and showcases how the four of them had grown in different directions since they’d first come together a few years earlier. Crosby is still the wild hippy, one minute breaking your heart with ‘Guinevere’, the next boring you senseless with ‘Almost Cut My Hair’. Stills is the musical bedrock who penned some of the group’s finest moments, but whose solo material seems the most dated to today’s ears. Alongside Nash’s simple but affecting material and Young’s more exploratory musings, it all comes together as ample evidence that CSNY were a real phenomenon. More at Drowned In Sound. Also, see Crosby, Stills, Nash & Young's Live 1974 Box Set Details Announced.